Miniaturized broadcast quality SD and HD video converter that converts HDMI into SDI for use with professional broadcast monitors, decks, routers, switchers and more. 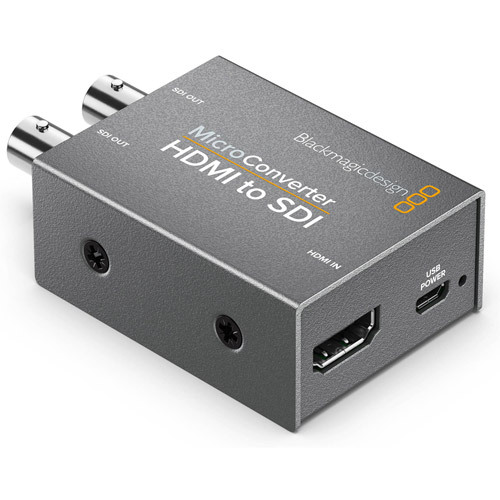 The Blackmagic Micro Converters are incredibly tiny broadcast quality video converters that come in two models, one for converting from SDI to HDMI, and one for converting from HDMI to SDI. The rugged, miniaturized design of Blackmagic Micro Converters makes them small enough to be used anywhere and conveniently hidden out of sight. You get HDMI and professional 3G-SDI connections for working with all SD and HD formats up to 1080p60, along with an external power supply. You can even power them over USB, so Micro Converters can be powered by big screen televisions or laptop computers without having to plug them into the wall. 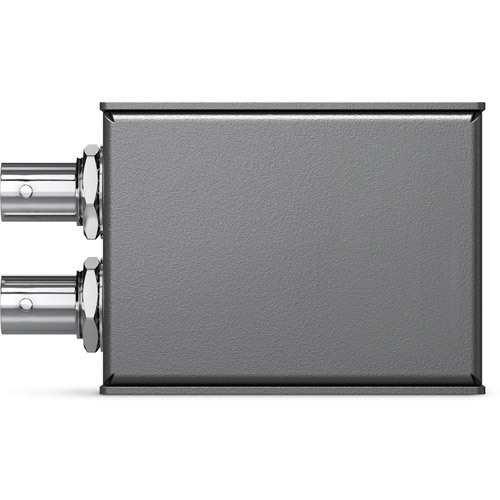 Unlike other small SDI converters, Blackmagic Micro Converters feature the highest quality broadcast technology, miniaturized into a proper metal enclosure so you get a professional design you can trust. You get full size professional 3G-SDI connections, HDMI and more. The converters include two LED status indicators to confirm power and video signal. Blackmagic Micro Converters include a power supply that has a USB connection. That means you can power it from the wall or you can use the USB power connection to power it from any USB socket on a television or a laptop computer. Even though they’re incredibly small, Blackmagic Micro Converters feature full size 3G-SDI and HDMI connections. 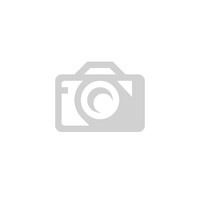 The SDI connections are multi-rate, making them compatible with SD and HD-SDI equipment. For maximum compatibility, micro converters support both level A and level B 3G-SDI devices. 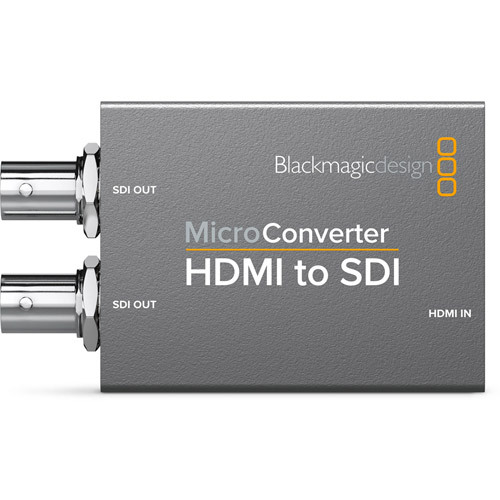 Micro Converter SDI to HDMI also includes an SDI input loop through connection. 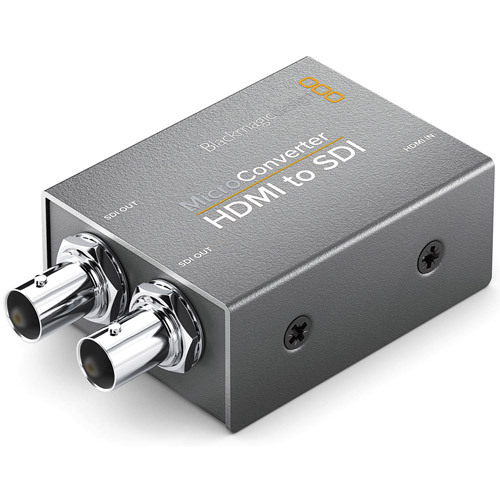 Micro Converter HDMI to SDI features two 3G-SDI outputs, so you can connect it to multiple devices such as switchers, routers, monitors and more. Blackmagic Micro Converters are powered via the same micro USB connection that’s used on smartphones so you can use the included DC plug pack, any USB device, or any smartphone charger to power the converters. The included DC plug pack supports 110 to 240V AC and comes with 4 different AC socket adapters so you can plug the converters into outlets anywhere in the world. That’s perfect for when you’re doing international work. You can even use smartphone chargers and rechargeable battery packs to power micro converters on set. 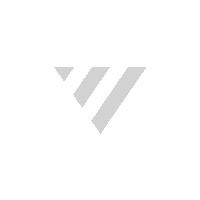 With so many an easy to use power solutions, you’ll never be without a power supply again.